Yin Yang The Meaning And Signifiance. Is The Yin Yang Relevant Today. Many people have seen the yin yang symbol in various forms and contexts. At the same time many people are not aware of the true meaning of the yin yang. You will come across several people who consider the yin yang to be a religious belief. What we are going to talk about in this report is interesting and different. We will not get into the origins or religious angle of the yin yang, we will instead see how the significance and meaning of the yin yang can be relevant to modern lifestyles. The underlying interpretation of the yin yang is that, there are two opposing forces that always reside next to each other. You could interpret these forces to be something like night and day, cold and hot, sun and the moon or even male and female. Most yin yang symbols are shown in two colors, black and white. The colors are absolutely different and very contrasting and yet, the two colors exist next to each other. It is this underlying concept that can be used to better our lives - this without any religious belief or tradition. 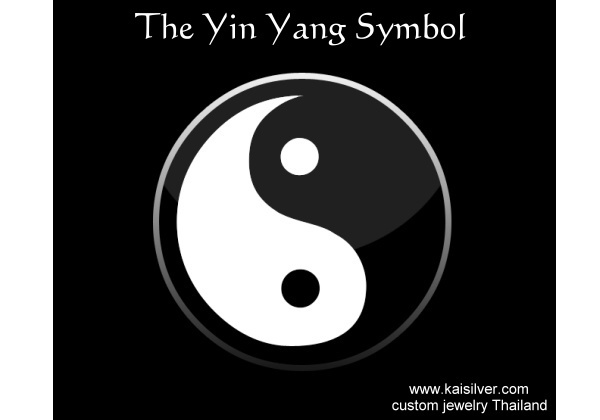 The above image shows the classic yin yang symbol in black and white. For a moment let us stop referring to this symbol and look at our life and real life scenarios. When we have to work or live with another person, there are bound to be differences in more ways than once. For example, you love country music but your room mate likes to listen to high volume pulsating rock. If you two have to live together despite this vast difference, you will need to work out some arrangement whereby both of you get to hear the music of your liking. If an equation can be amicably worked out, both of you can live in harmony. It is sure that besides music, you two have a lot of similarities or things worth learning from each other. For example, staying together helps share expenses, it also provides some company when you are lonely and feeling down. The yin yang inspires us to believe that, two very opposite forces can live together in harmony. You got to find ways to make this happen without, expecting the other person to completely change. Let us get back to observing the yin yang symbol once again, this time to notice another interesting feature. If you see the black portion of the yin yang, it has a small white spot and similarly, the white portion has a small black spot too. You can use this signifiance of the yin yang to be relevant to your daily life. This reminds us that nothing is all good or all bad - much like the yin yang where the black is not fully black and the white is not fully white. When you come across somebody who has very different ideas, habits or likings as compared to you - tell yourself that there surely be some traits or aspects of this person that either please or impress you. Or it could be that in some ways, the person is indeed quite like you. You rarely drink and never smoke, your collegue Tom finds to find the smallest excuse to down a few drinks - his drinking habit is something that you cannot readily appreciate. But it might turn out that Tom is the only one in the office who is always willing to help you with your workload. Even more important than that is the necessity to realize that, you might also have some habit or liking that, Tom cannot stand. We will now try to get deeper into the meaning of the yin yang and ofcourse, what it could teach us about. Take a look at the black and white portions of the yin yang image. It would have been easy to draw the two portions by running a straight line across the diameter of the circle but, that would reduce the significance of the yin yang. The white portion seems to flow into the black portion and a similar appearance can be seen in the black portion too. Scholars interpret this feature to mean that, the two opposing forces in life are never static - they are dynamic and keep changing all the time. What is yin today need not always be yin and vice versa. Let us presume that your business is going through rough times. You are sad, tense and depressed - with these feelings and emotions you can hardly expect to see a positive change in the situation. The problem with such a situation is that negative ideas crowd our mind, we strongly believe that nothing good can happen to us. Remember the dynamic nature of the yin and yang, you must believe the things will become better. This will allow you to think positively and look for avenues to improve your business performance and profits. Keep two aspects of the yin yang in mind during such times. The first is that, nothing can be all bad - a white dot does exist even in the white portion of the yin yang symbol. The other important feature of the yin yang is that, the two forces are never static, so bad times will give way to better days. Even the darkest of nights cannot last forever, it has to move aside and allow daylight to dawn. So what can you do to draw confidence and encouragement from the yin yang. Some people have the symbol firmly etched in their mind, they relate lifes activities to the symbol and make sure that they react in an appropriate way. You will find many homes with the yin yang symbol displayed on posters, decorative items, wall hangings or even on main doors. And ofcourse the demand for yin yang jewelry has always been very consistent. From our experience we have seen that, mens yin yang rings and other yin yang jewelry for men is more popular as compared to yin yang jewelry for ladies. There is no technical reason for this, the significance and meaning of the yin yang is equally applicable to ladies and men. If you have grasped the meaning of the yin yang from this brief report, you will agree that the yin yang theory is very useful to bring peace and harmony to married life. This probably is one of the reasons why mens yin yang wedding rings, are held in high esteem by many people. We do hope that you have enjoyed reading the above report related to the yin yang. Our team at easyrambler@rocketmail.com will be glad to hear your suggestions and comments. It has been a pleasure sharing these thoughts with you.